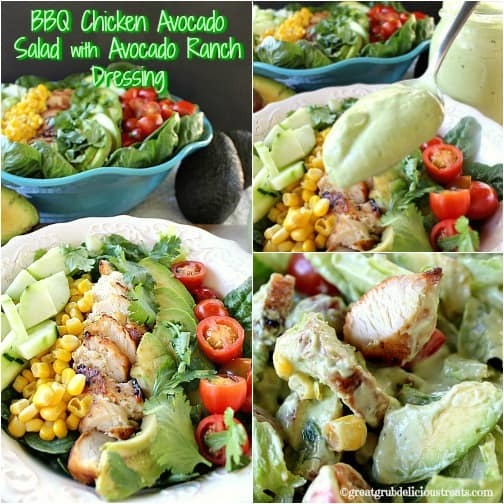 This BBQ chicken avocado salad with avocado ranch dressing is super tasty and is a meal in itself. So last week, we found this great ol’ country diner that’s been in this area forever but we had just never been there. Well, a fellow RN, Mitch, told me about this place (which I have seen and just never thought to go), and he talked about the great food they served. So last weekend we decided to check it out. It was great! All the food we tasted was fantastic but what really stood out to me was how delicious the homemade ranch dressing was. As we talked with our waitress about all this delicious food, I told her I wanted to purchase some ranch dressing for this specific recipe. 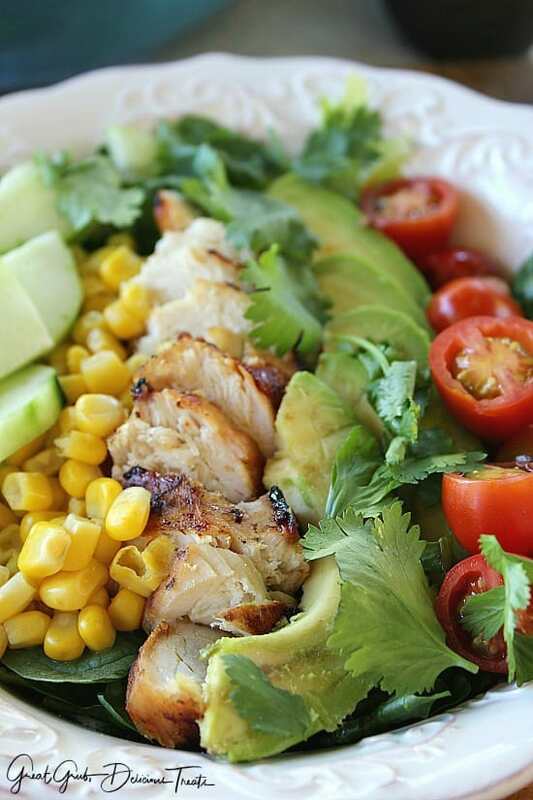 As we sat there and ate our lunch, all I could think about was making this salad. I do that all the time. When I get an idea about something that I’m going to make, that’s all I can think about. This is the result of our lunch at the Outpost Cafe® in Hesperia. The chicken is super good too! I actually made two different types of chicken on the grill but am sharing the BBQ chicken recipe with all of you. If you want to know the other way you can marinate the chicken, which is to die for, click here. Either way of barbecuing the chicken will be perfect for this recipe. 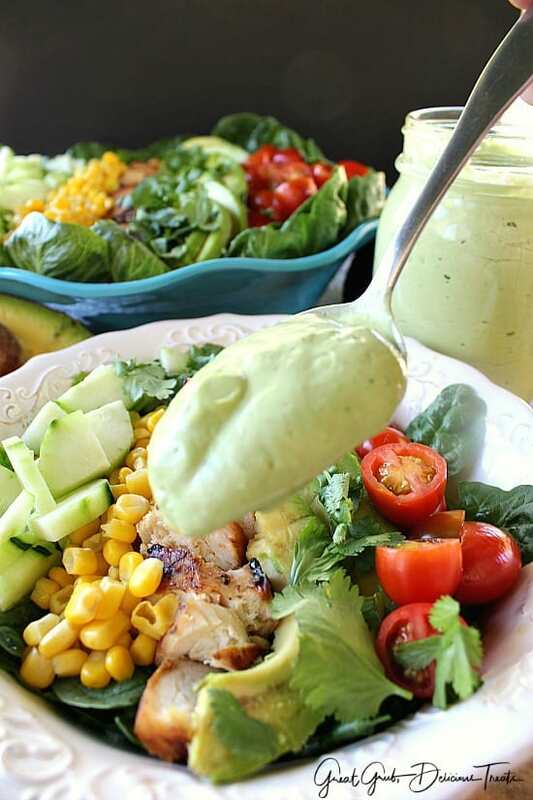 This avocado ranch dressing is super flavorful with the onions, lime juice and cilantro. I LOVE cilantro! When you are making this, if you want more cilantro, add it. These directions are pretty basic and can always be adjusted to your liking with either more, or less, of the ingredients. And when you make the dressing, using any ranch dressing will work. For me, homemade tasted amazing! 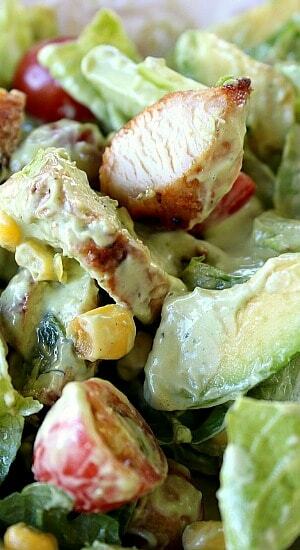 But there are a lot of dressings out there that are great and definitely will be fine when making this dressing. 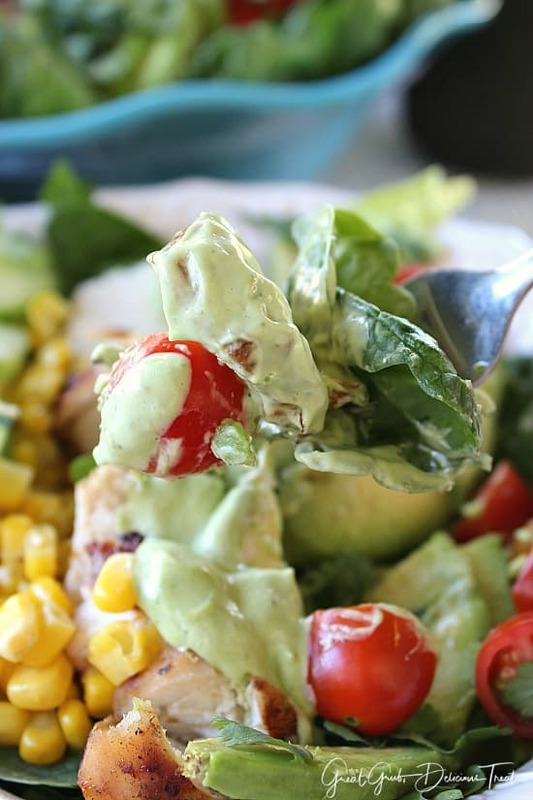 Avocados are so amazing in a salad and are perfect with this recipe. 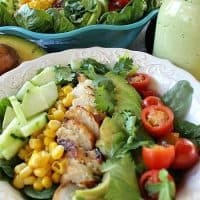 When I dished out my bowl of salad, I mainly had chicken, avocados, cilantro and tomatoes. My favorites. 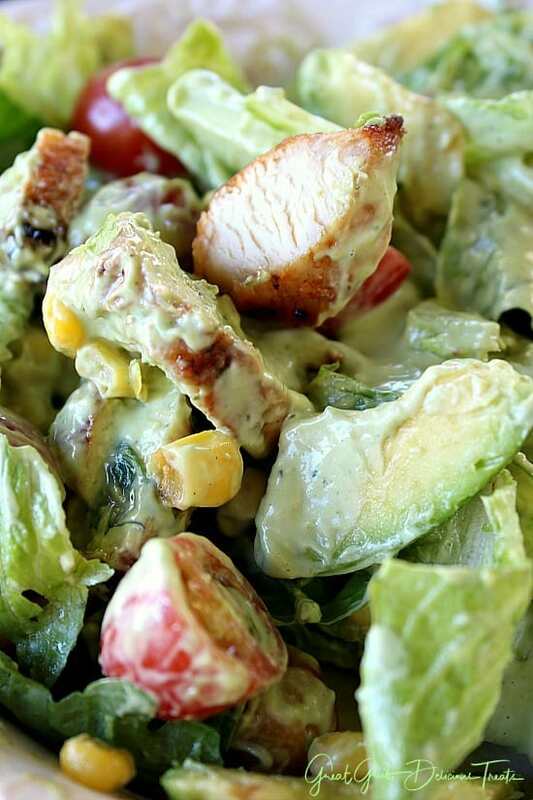 Having the crunchiness of the cucumbers along with the creaminess of the avocados makes for a great all round salad. I hope you enjoy this salad. 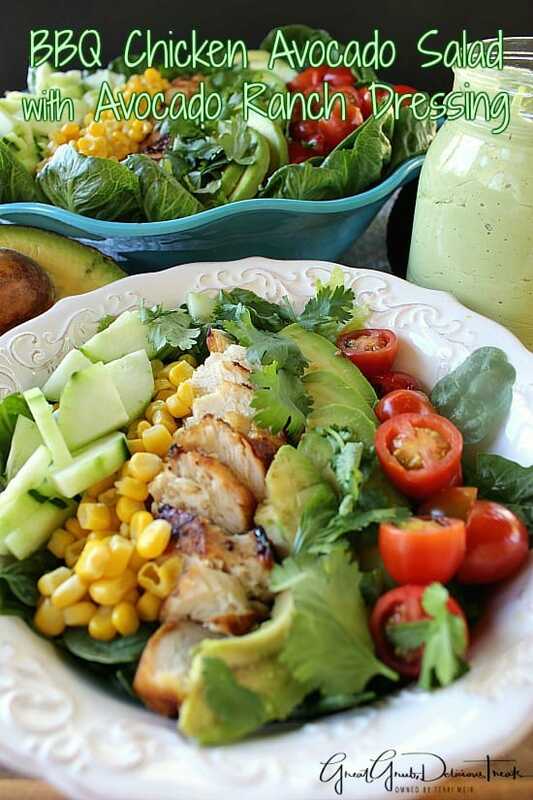 In a Vitamix® or blender, add ranch dressing, avocado, cilantro, lime juice, red onions and garlic salt. Blend until desire consistency is obtained. Put in fridge to chill. Place chicken strips on the grill. Sprinkle with garlic salt, pepper and coat with barbecue sauce. Grill on both sides until done. In a large bowl, add romaine lettuce and spinach. Add chicken strips, can cut in slices before placing on top of lettuce. 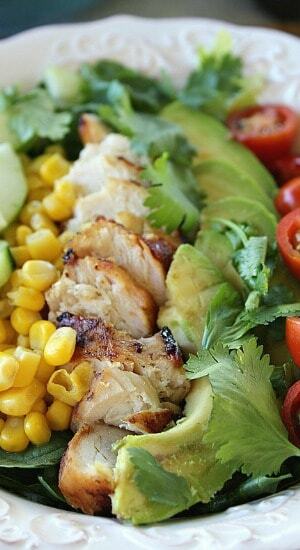 Next, add avocados, cilantro and tomatoes on one side of the BBQ chicken and add corn and cucumbers on the other side.